Ottman seems to thrive on action movie scores with a dark edge. For this tall tale about a giant crocodile menacing a lake (yes, ironically named Placid) he has created a monster of a score utilising a huge orchestra with a massive array of percussion instruments. 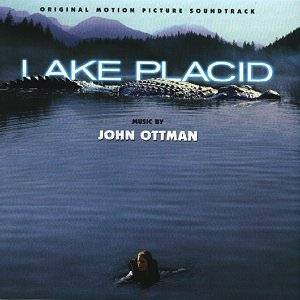 Although he does not achieve the stomach-churning terror that John Williams created with his infamous Jaws motif, Ottman comes close enough with his powerful and quote varied musical shock effects. He uses considerable resource and ingenuity. The swirling currents, the watery patterns of light and shade, and the murky depths of the lake are very vividly evoked together with a hidden presence of danger that you feel will leap out at you at any second. Ottman uses deep tuba, fluttering higher brass, numerous swift-stated, staccato, dotted rhythm chords, twisting, curling, gyrating figures on harp and strings, clanking metallic and dead wooden block strokes to evoke water disturbed by the giant beast, its swift, silent passage and its sudden, deadly attacks. Some relief is given with a brief love theme for strings, piano and harp but the 40 minutes or so of this disc is largely made of horrific aquatic figures which begin to pall at length. As vivid as it is, this album will really only appeal to those who want a memento of the movie. I do not think it will be visiting my CD tray very often.